I’ve been so preoccupied with SuperDuos and all the other new beads that keep coming out, I haven’t played with Tiles or Tilas lately. I’ve hardly used Half Tilas at all. Guess I better get busy with some of these patterns! This is another wonderful bracelet creation by my friend Teejay. She sent me one for Christmas and I blogged about it HERE. We decided to collaborate on a free pattern so that everyone can make some of these cute bracelets. It’s not easy to find nice patterns for Half Tila beads so I’m glad that Teejay dreamed up this one. I’ve got eleven more Lucy bracelets to blog about over the next couple of weeks and it’s hard to choose my favorites. I hope that you’ll like them and be inspired to make some for yourself. 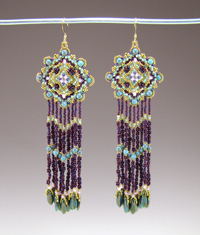 Back to one of my favorite beading subjects – pendants. Did you miss making your mother something for Mother’s Day? Got any weddings or graduations coming up where a personalized gift would be appropriate? Pendants are great and fast!! 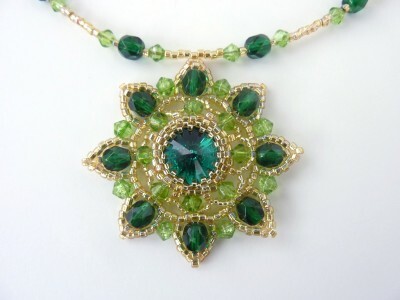 This pattern was modified from a free Russian tutorial… for a lovely 14mm rivoli pendant surrounded by 4mm and 6mm green crystals. My modified version of the pattern starts the rivoli bezel with a peyote stitch instead of right angle weave, which changes the number of surrounding crystals to 8 instead of 10, allowing room for additional crystals in the outer row. How many of you ever bought a tube of seed beads, then got home and realized you had 3 tubes already? I say you are consistent!! Many of us have a love affair with seed beads. Try one of these patterns to use some of those seed beads you’ve bought 9 times! It’s Bead Crochet today! OK, so I don’t do it, but it is so pretty. It’s definitely on my beading bucket list, along with 94 bazillion other things. So get your crochet needles ready, pick a project and DO IT! Beads + crochet = two of my favorite things, so when I saw this crochet necklace combo on Ravelry, I had to give it a try. 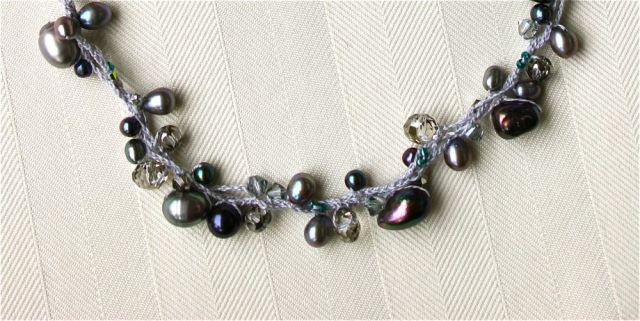 The detailed instructions are called “Infamous Beaded Necklace Tutorial”, by Devon Clement. There are many creative interpretations found on the “projects” pages there which provide inspiration aplenty. My beads were basically leftovers from other projects…freshwater pearls in various sizes, seed beads, and lots of sparkly crystal. 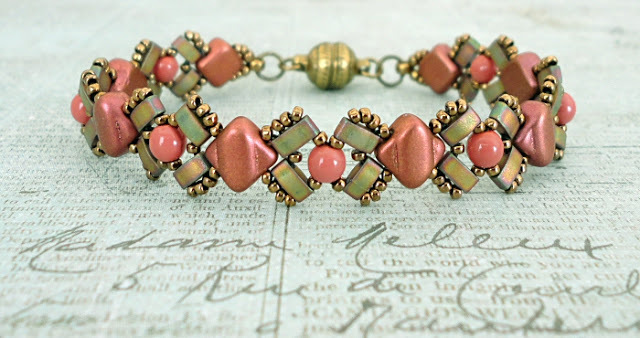 For you chain maille lovers, I have not just a few patterns and tutorials, but 6 collections of patterns and tutorials. Most are free, but some are paid. I find it helpful before buying a tutorial from someone new, to be able to try a free one to see if I like their style of writing instructions. 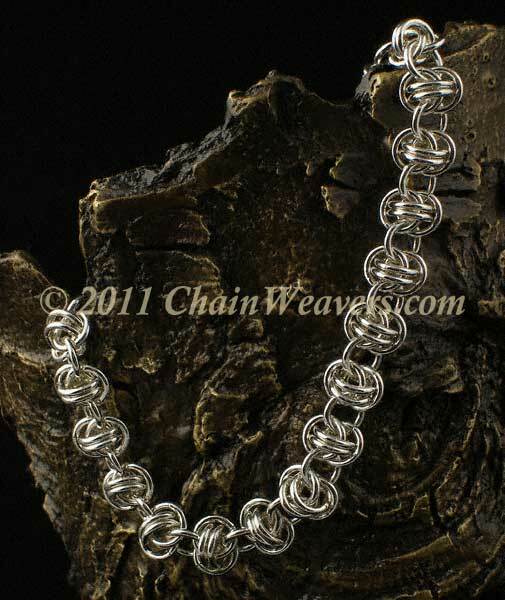 Chainmaille tutorials are written and organized with easy-to-follow instructions. Most of these chainmaille tutorials are really just instructions to teach variations on the basic chainmaille weaves. These are just the tutorials – if you want a kit with everything you need (including the tutorial) to make a particular item, please go to the ‘KITS’ page.